So, even though my life is pretty much the same, I’m more focussed, centered and less in my Ego. I’m more present. I’m not concerned about whether the pace of my life is moving too slow or whether I ‘should’ be having more fun or doing more, or seeing what friends are doing that I’m not. Right now, it’s boys, yoga & writing … every damn day. Sprinkled in between are the laughs, the phone calls or texts, rather than instagram or facebook likes or comments, and in-person connections that I’m excited about. 🙂 No comparisons. No drive to get ‘likes,’ which are never a substitute for off-line attention, appreciation or conversation, right? If someone really cares, they’ll reach out. Period. I also haven’t been distracted by my feed and prevented from doing what needs to get done. As a full-time single mother juggling work and kiddo activities, getting sucked into social media means less time to take care of me or this house or the boys. I even got the carpets cleaned—no more gross stains! And hired a handyman and squeezed in some fun posting a picture and seeing who approved of it. Here’s to more offline productivity and mindful fun. I’m teaching an extra class tonight and ordering dinner instead of cooking and cleaning. Not a bad deal. Life is Good offline this first week. Is a mindful way of life actually possible for most of us—especially those in the business world? 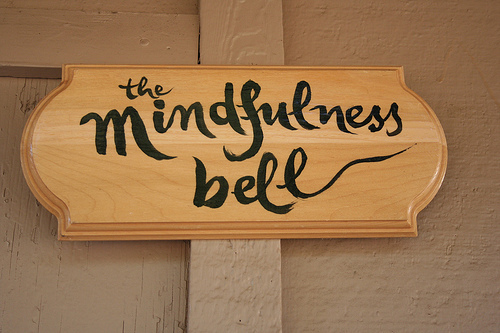 Can we really achieve mindfulness in today’s American society? Think about it. We are obsessed with multi-tasking and our devices that let us ‘stay on’ 24/7. On top of that, we keep pilling more onto our schedules (since, of course, we can handle more at one time now). Combine that with extra pressure and longer hours at work (See ABC News’ “Americans Work More Than Anyone”) and more stress with shortened fuses on the road and there you have it: a cocktail that completely erodes your 15 minutes of mindfulness meditation. Or so it would seem to me. But maybe I’ve got it all wrong? I’d love some input from any of you out there as I’m at a complete loss. Unless I’m in the jungle (where I found myself a week ago!) or on an island without wifi and electricity, I doubt that I can stop my multi-tasking addiction—and I’m just a mere freelance writer and mom. How the hell do executives learn how to put the devices down and connect fully with loved ones when the work day just never seems to end? I must admit that I’m a bit surprised by my skepticism as I’m the perfect candidate and proponent for mindfulness. I’m a yoga enthusiast and Deepak Chopra lover. Yet, I look around me—especially when at a business conference or with other journalists on deadline—and I wonder HOW can we be more mindful when stretched to the limits with multiple demands—sometimes needing to be met simultaneously. A few months ago, I interviewed Janice Marturano, founder of The Institute for Mindful Leadership, who left the corporate world behind in order to consult executives on how to become more mindful. In our interview entitled “If Mindfulness can Transform CEOS … Imagine How It Can Help You? !” Janice explained how she works with executives and managers to help them slow down and focus on what’s in front of them. She does this through teaching them how to meditate, ideally, 3 times a day. At the time of our interview, after also seeing how much she helped my brother, I was a huge supporter. I still am a huge supporter of what she is doing. Now that my toes are back in the business world, however, I’m getting a taste of the stress and the “pressure to be on” and I see how hard it is to be mindful in this environment. If you’ve ever been to a board meeting or in the audience of a keynote speaker at a conference, than I don’t need to tell you about the hundreds of blackberries and iphones in the laps of attendees who are multi-tasking by texting, emailing, or reading assignments. CEOs of the household are just as easily distracted. Go to a park or library, and likely you’ll see a mom or dad glued to his/her iphone while the kiddos are on their own. Again, it’s the American Way. And I write this with a bit of irony. I’ve been away from NavigatingVita for a month. During that time, I’ve juggled business writing and children’s schedules and illnesses—while stressing out about both. Somehow I managed to catapult myself away for a week to the southern most jungle of Costa Rica. While there, even though I had access to wifi at a main eco-lodge, I decided to cut the phone off. I left instructions to call a friend if there was an emergency with the kiddos and decided to brave being on my own without emails, texts, calls. (I was only away for a week, I could handle it right?.) At first, when watching some friends upload pictures on Facebook, or get basketball scores during our communal dinners at the lodge with wifi, I got a twinge of jealousy. After a few days of device detox, however, I found myself more engaged in my world than I have been in a long time. I held my attention and listened deeply when others talked. I looked around me—all the time. Of course, being in the jungle, demands mindful attention to avoid scorpions, lizards or crabs on your path. But when I looked up, I’d sometimes see monkeys swinging, blue butterflies, parrots, wild orchids and iguanas in the trees. I found myself looking around with wonder. I no longer wanted to check email or basketball scores. Twice during the week, I went back up to the eco-lodge with wifi and called my boys via skype to check in. I never turned on my phone, I used a friend’s computer. That was my only “connection” with the outside world. I lived. I thrived. I thought I was cured of my addiction. How wrong I was. Before I left for Costa Rica, I read two New York Times articles that I cut out to interview experts about for Navigating Vita. They touched a chord when reading them three weeks ago, and my time in the jungle re-inforced their importance. The first by Barbara L. Fredrickson is called Your Phone Vs. Your Heart. It shows, clearly, how children suffer from a lack of eye contact when parents are constantly looking at their phones and not paying attention. The second, is by Alina Tugend: In Mindfulness, a Method to Sharpen Focus and Open Minds, where Alina spends time with experts, including Janice Marturano, to learn how to meditate. What I thought about both articles, before I left for Costa Rica, pales in comparison to what I’ve learned upon my return. In Costa Rica, an environment that encourages mindful awareness and making appointments with wifi locations to communicate, I let go of my phone addiction. Sure, I was on vacation, but even when I’m not working, I usually tend to over-check the phone. I embraced being in the moment and made a silent vow to write this blog post as one that showed my success at tackling this distracted addiction of mine that most in Americans share. Well, I came back with multiple stories due, meetings to attend, taxes, sick boys, etc. And I found that being back in my old environment with multiple demands, I instantly fell back to my old habits. Sure, I still tried to meditate every day, and managed to squeeze in yoga twice, but it didn’t stop me from texting or calling someone while in the car. I raced back and forth from appointments or kids school or sport functions—all the time clinging to my phone, in case as a client or colleague or even a friend needed to reach me. Just doing that, made me think about those possible needs, instead of listening to my children. I’d worry about an assignment and say, “Sure,” or “Ahuh” absently to something that my four-year-old said. Who suffers from this sort of distraction? Me. And my boys. I remember when interviewing Janice, that she advised me to turn off my racing mind and actually enjoy the moment—whatever moment—I found myself in. So instead of bringing my business meeting into my shower or my car ride, I need to shut off, and enjoy the ride with the kiddos or the warm water of the shower. By not stressing about all the ins and outs, and being more present, we can all be more productive later. Think about the manager who actually cuts off the phone and listens intently during a meeting, verses the manager who keeps looking at his blackberry or the clock when you’re talking. I get it. I’m just not living it during times of pressure. Maybe there’s an app for that? 🙂 I know … But seriously. Maybe during my most hectic points of the day, I could set a mindfulness alarm on my phone. “Time to be mindful, Laura” could go off when I’m typically in the car with my boys, for instance. Or maybe: “This is your mindfulness moment. Turn off the phone” could go off just before dinner, bath and books time in the evening, so I can give my boys my undivided attention. Just an idea. Have any others? Clearly, I could use the help!